If we had to guess, we’d say life at your institution is generally going well. You’re busy. Your campus is busy. Your IR department is certainly busy. Students are passing successfully through your program. Reports are being created. Decisions being made. Market focus is increasing. You know what else is increasing? Pressure from outside sources. Increased competition for students. Increased government auditing and oversight. And, as a result, increased pressure to generate and maintain an accurate view of what’s happening in your organization. Let’s talk about that last point—getting a handle on your university’s performance across many different measures. We work closely with IR departments on a regular basis. We know their challenges. We know the tools they’re using. We know the 1000s of requests for reports that they get on a weekly basis. We also know something that many institutions might not know. Patterns are emerging involving resources like your IR team and the data they have to work with showing less than optimal utilization—through no fault of their own. Let’s just look at two basic areas involved in how your university and staff are building and using your view of performance. Data and consumers. From a data point of view, you might not be aware that several types of inconsistencies almost certainly exist in your institutional data. Again, not blaming the IR team, here—just helping them highlight an issue. Data error exists in the form of duplication, missing data, out of tolerance data, typos, mislabeled records, etc. Much of this comes from rekeying or substandard data sharing from multiple locations scattered throughout the university. Synchronization issues and lack of data dictionaries which can drive uniform measurement and tracking cause reports to potentially give false or incomplete readings. The worst possible outcome of this is poor decisions being made on unhealthy data. Something you clearly should strive to avoid. These are real problems. They are quite common and exist in many institutions. These problems are potentially undermining your ability to achieve high performance goals. To fix these problems requires a top-down initiative involving collaboration across several departments who either own, maintain, share or consume all or part of your organization’s data. And, collaboration with your IR department who is in the best position to maintain a clean, up-to-date, aggregate snapshot of your performance trends. The good news is that these are solvable problems. IR can be at the heart of driving the solution. But—and this is our main message to you—they cannot do this alone. They need your endorsement and support in order to drive needed changes throughout your institution. SDD has turned this process into a workshop exercise and is well-positioned to help such a project succeed. 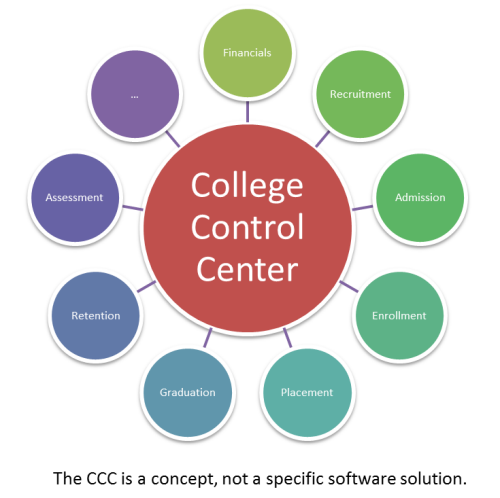 We do this by suggesting that you build a College Control Center (CCC). We’re not talking about any specific software platform here– that doesn’t matter – we’re talking about information, data, decisions. We suggest all colleges challenge themselves to build a CCC. Why? Because building a CCC will take them through a journey that involves fixing and updating all critical areas of information in the process. The CCC is easy to understand, and forces focus on the basic, most-critical elements. This focusing is the key exercise. In the process of creating the CCC, you’re solving low-hanging fruit problems, pooling data sources, cleaning and normalizing data, raising visibility to the role and importance of data elements, educating the consumers of that data on its patterns, tolerances, norms – this in turn drives increased utilization of the data – and more insightful referencing and decisions made from it. The end result of building a CCC is a more informed, more connected, more collaborative campus-wide team responding to your organizational data – with a strong understanding of ROI as seen from various POV throughout the university. Why is SDD Able to Help Achieve This? We are not vested in the success of any one department. Internally led projects tend to favor the agenda of the departments in charge – be they IR, IT, or wherever. Often this comes at the expense of overall success. SDD stays focused on next steps that work – without concern for maintaining status quo or leaning toward any one department’s views. We are experts at iterative steps forward – with ROI at every step along the way. 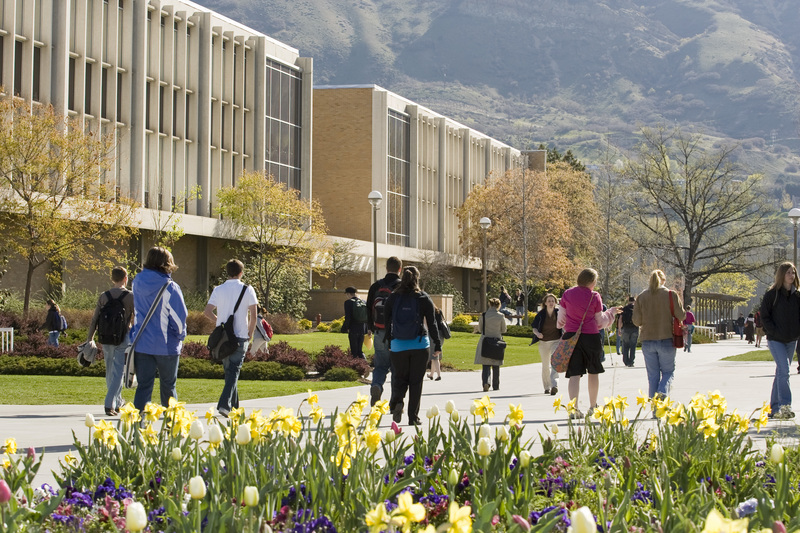 Many Higher Ed projects are just that – projects. With long lead times and frustrated users waiting for results. SDD identifies short term steps that lead to long term success – but that also provide short term gains that are measurable and impactful – not only getting immediate ROI but also providing ongoing motivation to continue. We also tune up all the touch points needed, not just focusing on one area. We are not selling software. Too often the first step in improving analytics is to go investigate and purchase tools. This is what software vendors would have you do, promising success due to their magical ease of integration and intuitive user interface – not to mention fancy charts with dancing bears. SDD understands that the key to successful use of analytics is to improve the people and processes surrounding decisions that are data driven. By focusing on these areas, and often by using tools that already exist, great leaps forward can be achieved. We provide just enough guidance to move things forward at a ‘doable’ pace. Big project analysts, internal or external, who approach the problem as a big multi semester project with many pieces can seem good on paper, but the expense quickly grows and the return can be a long time coming. SDD provides a lean approach that guides your team toward improvements at a pace they can handle, with demonstrable results along the way. We work toward a bigger vision but we don’t oversell – or overcharge. We have the experience needed to gain your trust. Internal project leads and even outside vendors of software or general BI consulting may not be able to directly address the hurdles that exist in the Higher Ed space. SDD knows Higher Education. We have vast experience in complex data and analytic systems. But we also know how to break down the barriers between IR, IT, Academic Affairs, and the rest of the stakeholders, while respecting the ongoing work these groups need to continue. Why Can’t This Be Solved Internally? As is typical of any multi-departmental organization, you have isolated groups within your team that have individual, and often competing, goals. This inhibits cross-departmental collaboration and makes it almost impossible for any one department, such as your IR team, to drive initiatives that involve these multiple groups. It is a classic dynamic that exists in universities. It is best addressed by having an outside, non-vested resource drive the initiative, where a clear understanding of objective goals without bias help facilitate communication and collaboration where it’s needed. We ask for a few minutes of your time to expand on this issue, describe the CCC concept in more detail, and explain how we help universities address it. With your approval, we can successfully, quickly and cost-effectively help your IR department improve their data picture, their use of resources and time, and their consumers’ understanding of the reporting and analytics that you’re using to respond to the increasing market pressures.